Everyone knows that outdoor air is filled with pollutants, but did you know that the air in your home may be just as bad? FACT: The EPA ranks indoor air quality as a top-five environmental concern. FACT: Air inside can be up to 100 times more polluted than the air outside. While everyone can benefit from improving indoor air quality, if someone in your home suffers from allergies, asthma, headaches and other health worries, optimum air quality can be critical. Capital Control Systems can guide you to just the right system for your unique needs and space. While portable air cleaners can provide a level of effectiveness in individual rooms, whole house air cleaners work with your heating and cooling (HVAC) system to clean the air going through your duct system. As air re-circulates, high-power air cleaner's in your HVAC system, capturing the majority of airborne dust, pollen, smoke, pet dander, mold spores and certain bacteria. Installed out of sight, whole house systems work quietly and invisibly. Today's energy efficient homes can restrict intake of fresh air and trap dust, allergens and more. One solution is the Trane CleanEffects�. Trane is an industry leader in home comfort. They set a new standard for clean indoor air with the revolutionary Trane CleanEffects�, the world's most effective whole-house air filtration system. Personal Service. Personalized Filtration System. Since no two homes - like no two individuals - are alike, let us craft an indoor air quality system specific to your unique needs and conditions. 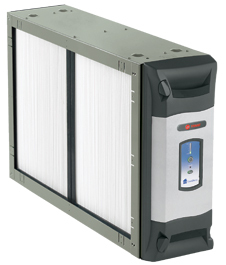 Contact us today for a free evaluation and estimate of the best air quality system for use in your home - or business!